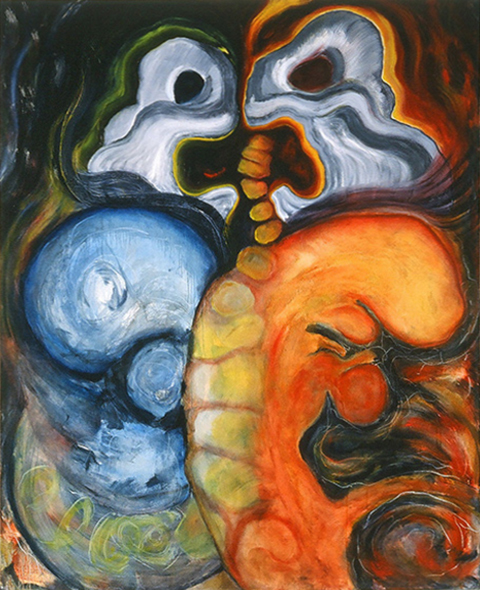 Wailing Pelvis #2 1996 oils/canvas 48 x 60"
The Wailing Pelvis Series expresses deep longing and horror, representing the Great Earth Mother, furious at the abuse of her environment. Dbl. 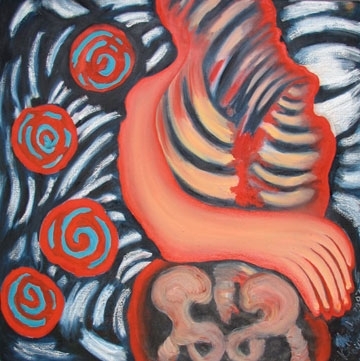 Fetus Butterfly w. Wailing Pelvis 1997 oils/cnvs. 60 x 48"
Using the body as metaphor to address the human psyche, my work is rich in content with strong archetypal and biomorphic images. Although my initiating impetus is often rooted in the personal, the completed works speak to the universal, reflecting larger concerns with the soul of humanity and our severely impacted natural environment. The wailing pelvis image represents fertility, Mother Nature and her horror at the abuse and neglect of earth and the environment. 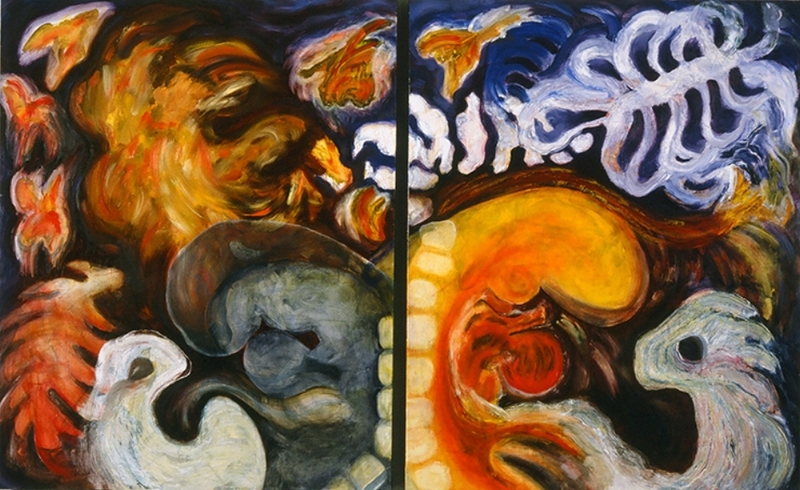 Releasing My Butterflies 1997 oils/canvas 60 x 96"
This diptych is a biomorphic symphony! It followed "Double Fetus Butterfly" with the backbone of that piece now expanded into a whole ribcage and the wailing pelvis divided, encircling the double fetus butterfly. 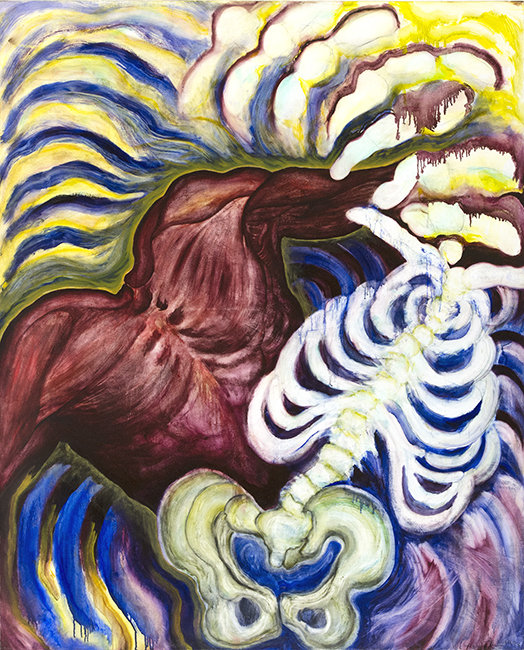 One example in my work of the personal shifting into the universal is the Wailing Pelvis image (1995-97) which came to me when I was painting my sorrow, as my grown sons were leaving home. However, as I painted, it became something much deeper, a wailing Mother Earth grieving for the loss of her children and the destruction of her environment. 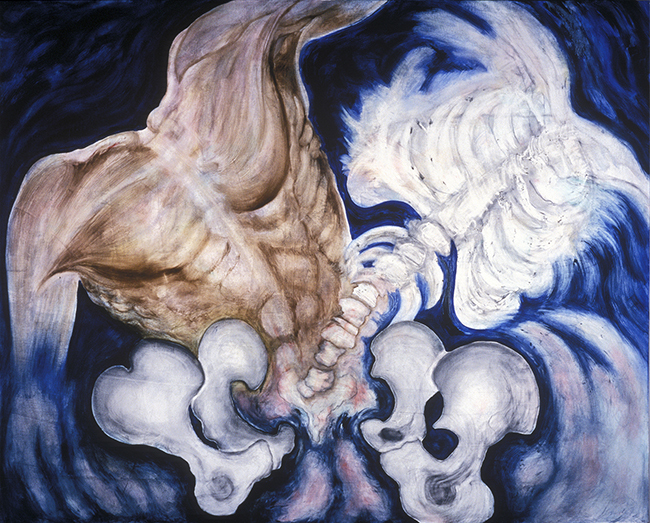 Body and Soul #1 1998 oils/canvas 60 x 48"
The wailing pelvis with attached ribcage expands further in this piece with the ribs floating out to enclose the whole composition, including a muscled torso, all very expressively painted. It was first called Torso with Ribcage, but felt so powerful it needed a deeper title, thus: "Body and Soul." Body and Soul 1998 oils/canvas 48 x 60"
This piece was a culmination of my Ribcage Butterfly series, which responded to considerable changes in our natural environment and our personal lives. Physically it presents layers of our existence. Symbolically, the bones represent what is essential and what remains behind. The pelvis represents creativity, reproduction, fertility, mother earth. 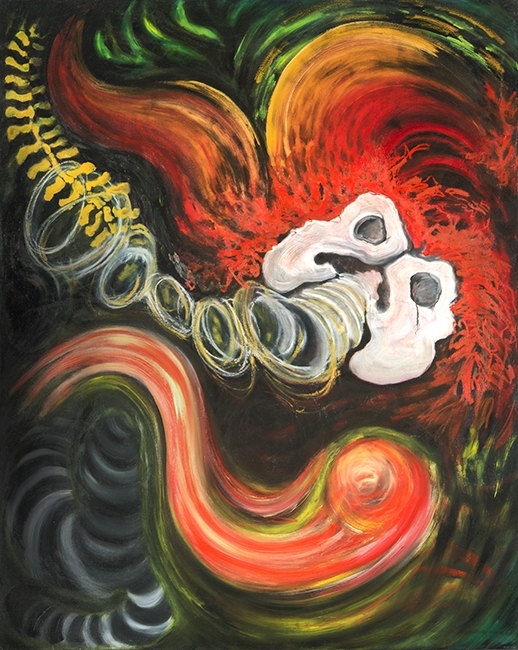 Enraptured - Interior 2007 oils/canvas 36 x 36"
A biomorphic, abstract, transparent figure reveals her inner workings. Her winglike arm is wrapping around her. Enraptured/Our Lady 2007 oils/canvas 48 x 60"
A cocooned, fully wrapped figure plays counterpoint to a flowing body- of- roses figure. This precedes my “Our Lady of the Roses” Series of 2007-08. 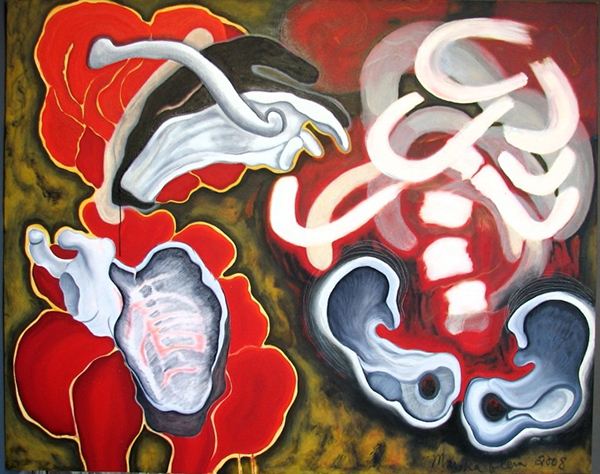 Scapula/Wing 2008 oils/canvas 48 x 60"
This painting was an overlap of the Roses Series of 2007-08 with the abstracted bones of the Wailing Pelvis Series. So we have a glowing pelvis, two scapulae, and abstracted floating ribs with large roses behind them. This series, "Heart of the Matter," began in 2014, as my return, once again to painting, after four years of ceramics work. 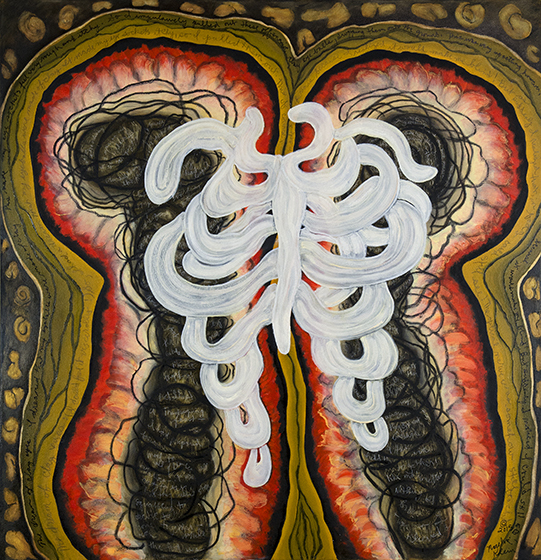 Revisiting themes and images from the earlier biomorphic work, the ribcage and double fetus butterfly are central to this series. As in the series of drawings that preceded this painting, I have embedded text from forty years of dream journaling. 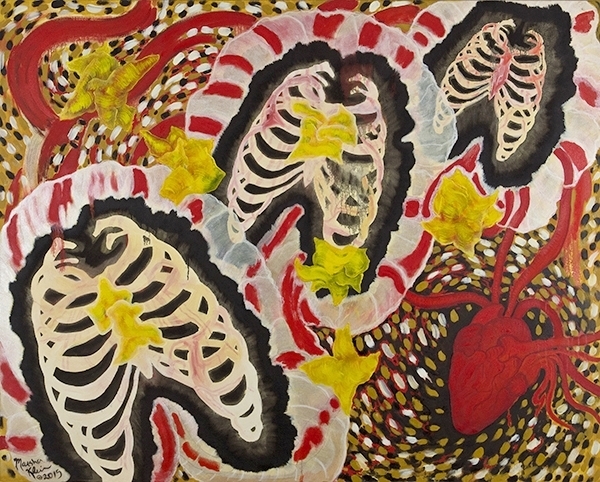 Three Rib Circus 2015 oils/ canvas 48 x 60"
This series, "Heart of the Matter", began in 2014, with 50 drawings, which was my return, once again to painting, after four years of focusing again on ceramics sculpture. Revisiting themes from earlier biomorphic work, just as I did in the new sculptural series, here are ribcages and translucent fortunes with a heart added as the central images. 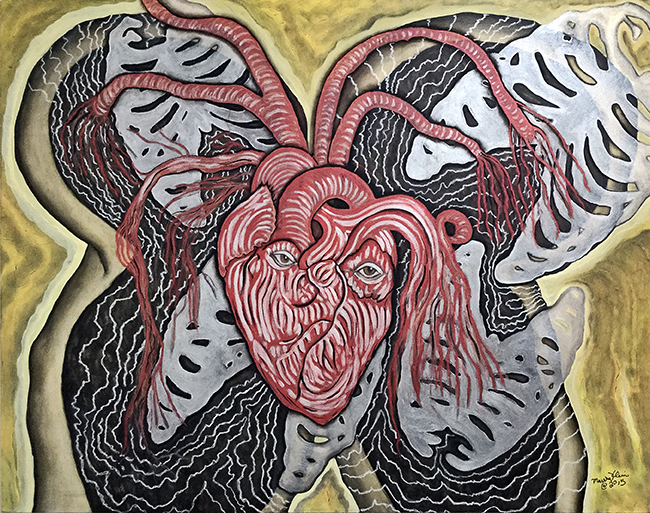 Heart of the Matter 2015 oils/canvas 48 x 60"
At this point, with the intent to synthesize the mediums, themes and images that have pervaded my lifetime of artmaking, I want to get to the essence of what it is that I have to say, to the heart of the matter, both literally and figuratively. This series, "Heart of the Matter," begun in 2014, was my return, once again to painting, after four years of ceramics work.